This is my grandmother’s recipe and my mother taught me how to make them. Sometimes my uncle would come assist. Now my daughter and a friend’s daughter help me. These are plain, simple and simply the best hamentashen ever, because they evoke childhood, family and Jewish life in the best possible way. They may be filled with poppyseed, prune or apricot, but they taste of love and memory. Preheat over to 350 degrees. Mix flour and baking powder together and set aside. Cream together shortening and sugar. Add eggs one at a time until each is thoroughly mixed. As you get toward the sixth egg, the mixture will look kind of curdled. On low, slowly add dry ingredients. You can probably use the mixer until the end if you are using a powerful stand mixer with a paddle. If you are using a hand mixer, you will probably have to turn out the dough onto the table at some point and knead in the remaining dry ingredients. Add a little orange juice at the end to moisten. You will not use the entire quarter cup, or the dough will be too sticky. Once dough holds together in a smooth ball, you’re ready. I like to cover the bowl with a damp towel as I work with small pieces of dough. You can even keep it in the refrigerator as you do this. Take a fist-sized piece of dough and roll out thin, to less than a quarter of an inch. Cut with a large, circular cookie cutter, about 2 ½ to 3 inches in diameter. The dough is stretchy and springy and will shrink back, especially as you go on and reroll scraps. You may have to roll or pat out each individual circle as you work them. Also, flipping them over, so that the stickier side is face up, helps the hamentashen seams stick together better. In the center of a circle, place a small bit of filling. We like apricot, prune and poppy seed, but others like more wild things like Nutella. Sometimes we make marzipan filling. The stiffer the filling, the larger the amount the dough can take, but in general each circle can handle about ½ to 1 teaspoon. Bring up edges of the dough to form one corner and pinch together so that the dough does not separate. Then bring up another edge to form two opposing corners. Pinch together. Voila, Haman’s hat. Place on a parchment lined cookie sheet and repeat. 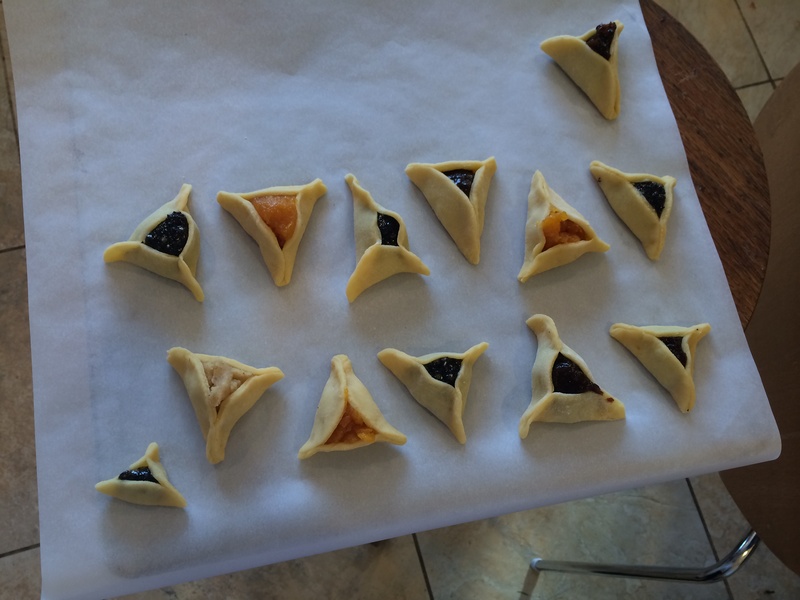 When you fill a sheet with 20 to 25 hamentashen, brush with egg wash. Bake for 20-25 minutes until lightly golden. Depending how adept you get with the dough and how large your cookie cutter is, you can get 80 to 100 cookies out of the dough. *I make them pareve, so I use unsalted margarine, which I think makes the dough a little more durable and elastic for rerolling of the scraps.